I hope everyone had a fantastic Valentine’s Day!!!! What did you do?? If you answer, don’t give too many juicy details..LOL!!! A couple people I know got engaged, and I congratulate them both so much!!! What a great day to begin the journey to becoming an old, married couple! I know this because that’s how Mike and I began. 5 years we dated since high school, and then finally he popped the question. February 14, 1999 (yes, we are old!) was the day he put the ring in my glass of wine after having a lasagna dinner (yes, I cooked), and we watched Sleeping Beauty, because back then I was all about Sleeping Beauty for some reason. We had a looooong engagement (3 years) until our October 2002 wedding day. We were still in college, so one of us had to graduate first and make money. But anyway, this year’s Valentine’s Day was just down-right busy, so we may be celebrating a week late, along with celebrating my dad’s birthday. Speaking of Dad, he’s finally out of rehab after 3 long months and is back home!!! He’s doing well with his walker and is slowly working his way back into becoming an independent individual again. On the other hand, the past 4 months have taken a major toll on me, not only taking care of myself and my family was a struggle, but taking care of somebody else’s phone calls, finances, home, appointment schedules, etc. etc. was twice the amount of stress my body had to deal with. The stress was so bad that I gained weight, lost some hair, and smashed my cell phone. I hardly had a life for a while, and I’m slowly making a comeback. Now that we are soooooo close to having a few caregivers set on a good schedule, I’m ready to hide and get away somewhere. My goal from this point on is to get myself healthy again, just like my dear ol’ Dad. But while I was gone from here, I did find some time for an escape in baking. 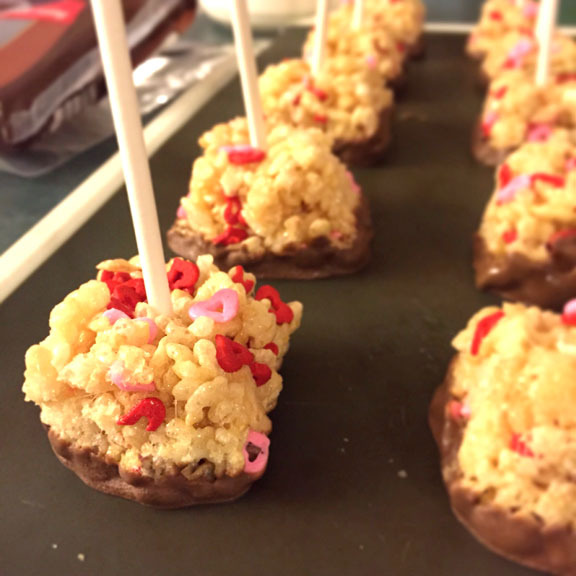 I’m a cereal fiend, and it’s been a while since I had those popular crispy rice cereal treats, but this time I added heart sprinkles, chocolate, and turned them into treat pops. 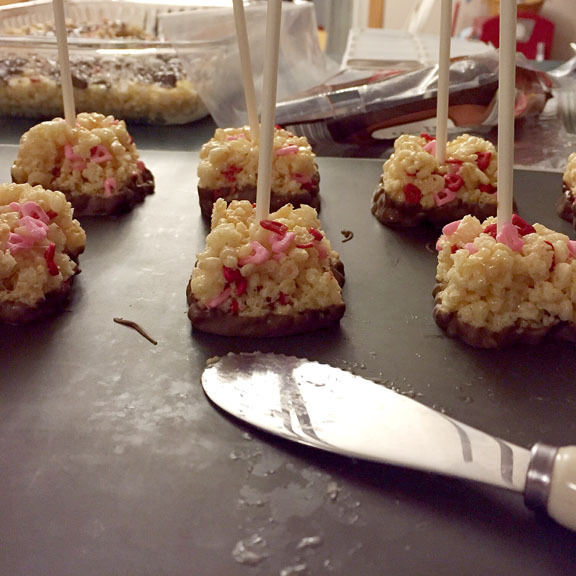 Unlike the cake pops, there was really no need to dip the candy stick into melted chocolate to hold it in like glue. The marshmallow mixture pretty much did that for me, but the refrigerating process was still used to give me peace of mind. This dessert is a great universal treat for any occasion. Look for seasonal sprinkles and there you go!! 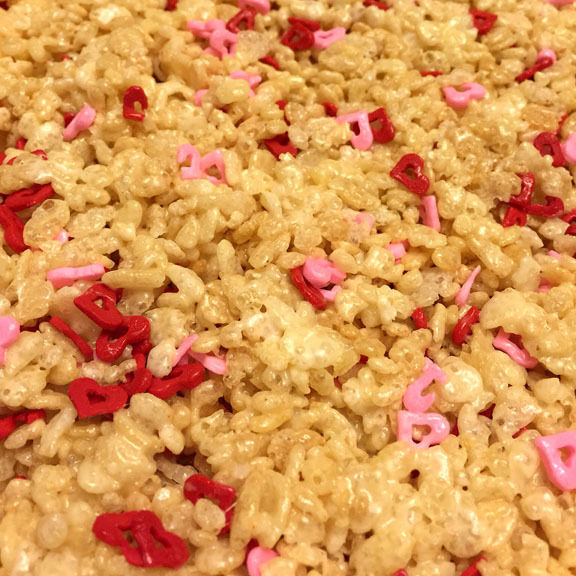 First, I followed the original recipe from Rice Krispies, but I added the heart sprinkles at the same time as the cereal. Then after the ingredients firmed up in the 13×9-inch dish, I cut it up into small square pieces, carefully pushed the candy stick into each square while reshaping the square if needed, placed them on a large baking sheet sprayed with non-stick spray, then refrigerated them for about 30 minutes to 1 hour. When it’s time to do the dipping, I melted chocolate bark in a microwave-safe dish (two blocks for 50-55 seconds, but after 25 seconds, stop and stir the blocks around, whether they’re melting or not. You don’t want the chocolate to burn! ), and carefully dipped each square into the chocolate and then set them down on a silicone mat and let them set completely. Viola!! 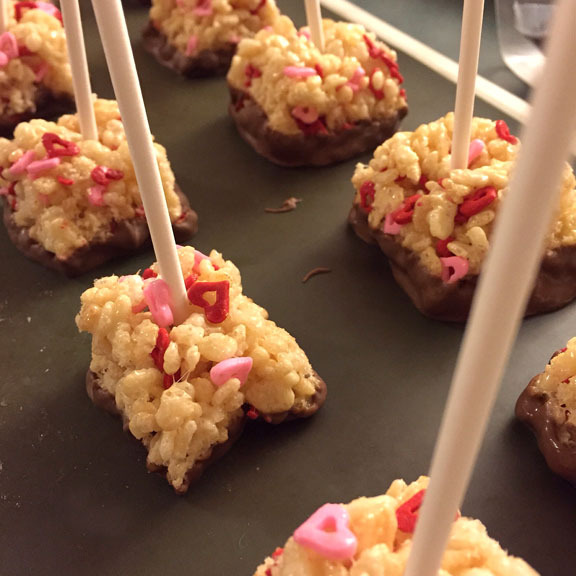 A nice, simple treat for your sweetheart, at any time of the year!! NOTE: You can also use a sheet of waxed paper instead of a silicone mat, but the silicone mat seems to help prevent the chocolate from sticking too much once it’s set, plus you don’t have to fight with the waxed paper since it can move on you when removing the treat pops. Here’s the silicone mat I use.